Disclosure: This stay at Embassy Suites Downtown Minneapolis was hosted, but all thoughts and opinions are my own. My family and I went on our first full-fledged family vacation! The destination we chose? Minneapolis, Minnesota! Since we are from Southern California, we wanted to take trip someplace that had cooler weather, so it would have that “Christmas feel”. Minneapolis definitely has colder weather, and with having so many attractions/activities for kids, along with an eclectic food scene and bustling downtown, it seemed like the perfect destination for both myself, my husband, and my daughter. Since we were travelling as a family, we also wanted to find a hotel that was just the right fit for us, so we stayed at the Embassy Suites in Downtown Minneapolis! We wanted a spacious hotel room since my daughter loves to run around, and we also wanted to be able to watch TV or sip wine in a seperate living room area after my daughter’s bed time. Embassy Suites all have a living room and bedroom, with doors separating the two, which makes it easy for the littles to sleep soundly while the adults relax in the living room for a couple more hours! The bathroom was also incredibly spacious, probably the largest bathroom I’ve ever seen! It was perfect for a family of three all sharing the one. The picture above shows just about 1/2 the space of the bathroom. We all co-slept in a king-sized bed (there’s also a flat screen TV in the bedroom). Normally while staying at hotels, I have difficulty sleeping, but the mattress and pillows were so soft and comfortable it was no problem getting cozy. Being a blogger, another plus was that the hotel room had outlets and USB charger outlets everywhere! I have found so often older hotels don’t have many outlet spaces to plug in, but since the Embassy Suites Downtown Minneapolis is relatively new, they built it to be equipped for a family to be able to charge phones, iPads, computers, you name it! 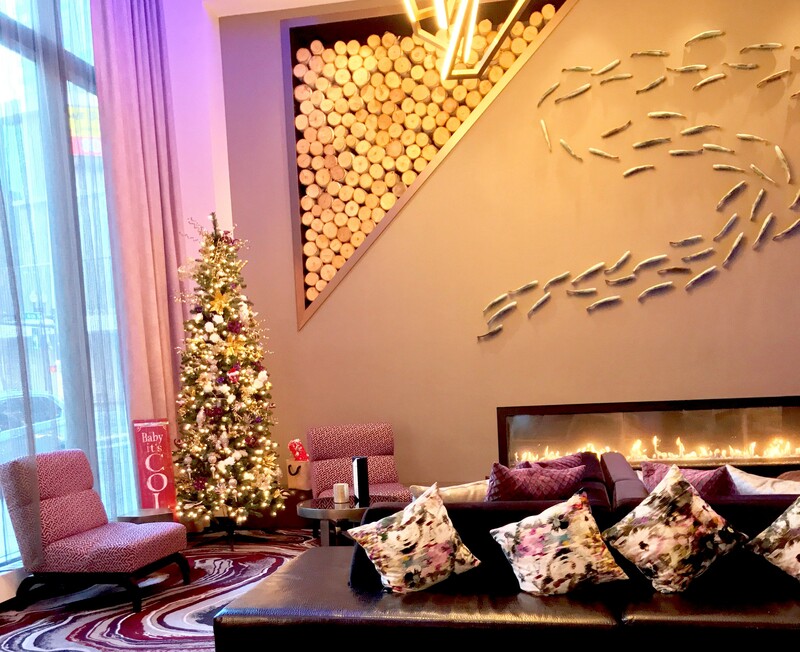 The lobby and lounge was decorated festively for the holidays, adding a touch of magic to our family’s Christmas vacation. In the lounge area, you could order drinks and food, as well as enjoy the Manager’s Hour from 5:30-7:30, where there were daily free cocktails, wine, beer, and snacks for guests. There is also free daily breakfast! And I don’t mean your standard hotel continental breakfast, Embassy Suites has a full service, made-to-order breakfast, including eggs, omelettes, pancakes, oatmeal, yogurts, etc. The eating area for breakfast had large windows, so you can eat breakfast while enjoying a view of the downtown buildings. The location was superb, since it was one block from the light rail station, which we used to get around Minneapolis and the surrounding metros. This was a huge plus for us, since we didn’t want to have to push a stroller too many blocks through the cold to get around. We were able to conveniently stroll down the street (3 minute walk), hop on the train and conveniently go anywhere! Embassy Suites Downtown Minneapolis is a pretty central Twin Cities location, so it’s definitely an ideal spot to stay! Or if you don’t feel like hopping on a train at all, and want a snowy day inside, you can take the hotel’s enclosed sky bridge across the street to the Nicollet mall, shop, grab a coffee, and then spend an evening enjoying the manager’s hour and your room’s amenities. The ultimate cherry on top of our trip, was that my daughter saw her first ever snowfall out of the windows in our hotel room!